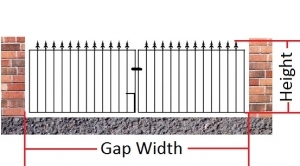 The widths shown are the size between your posts or pillars (gap width) and NOT the actual size of the gate or railing. Step 1 – Measure the gap that you wish to fill (top and bottom gap measurements). Step 2 – Decide on which side the latch needs to be fitted as viewed from the roadside or outside looking in. Step 3 – The standard allowance for clearance is 6 cm under the gate or railing. If you plan to hang your metal gates or railing on posts you need to allow extra space for them. If you already have steel posts, brick pillars or walls, simply take the measurements between them, top and bottom. Please note that the widths stated for our balconies are the actual size of the balconies, and the heights shown are also the actual height apart from our spen curved balconnette which is 1100mm high from the floor plate to the top (1140mm high in total). Our balconies are not supplied with fixings - you will need to decide which fixings are best for the material you are fixing to. We supply our balconies with 12mm holes for fixings. Our balconies can be made to any size so if you don't see the size required please contact us. For larger items (such as gates and railings) you will be contacted when your item is ready to ship to arrange a delivery date. For smaller items we may not contact you, your item will be shipped as soon as it is ready. Please note that often our delivery times may be quicker than stated above - so please contact us if you are in a rush for your item and we will see what we can do.